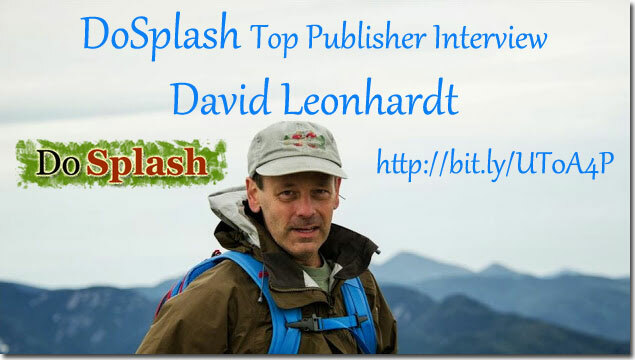 This week at the Member Interview series we have David Leonhardt. David is a very nice and humble guy. He is also a very long time friend of mine. He is very helpful and quite active on social media and blogging communities like DoSplash. Let’s hear what he has to say. Hey David, please introduce yourself to the DoSplash community. I’ve been doing communications all my life. I am now running The Happy Guy Marketing, which does half-and-half writing (books, blogs, screenplays, speeches, etc.) and half promotion (SEO, social media). I began in high school, where I was co-editor of the student newspaper. I have loved writing ever since, which is why my blogging “schedule” tends to be “when I’m inspired”. Please let us know about your online business and the websites you own. My main business website now is http://THGMwriters.com where I run our writing services with a team of a dozen writers, editors and translators. I personally write most of the high quality online content; my team does most of the books and screenplays. The promotions are run out of http://www.seo-writer.com, which is in desperate need of an overhaul (both design and content) and http://www.seo-writer.ca for the local market. Can you tell us a bit more about your association with “SEO”? – I ask this since your domain name reads seo-writer. A decade ago, I discovered that I was good at SEO – just by accident. I wrote a few forward-looking thought leadership articles on SEO; that was back before it was fashionable to predict algorithm changes. Before I knew it, I had three SEO clients, and I realized that I might even be able to feed my family that way. I do very little pure SEO these days, but SEO is background to a lot of what I do with content creation, promotion and social media. What do you think about the recent SEO changes? I like most of them. Anything that devalues overt manipulation is good. In particular what do you like about the Panda and Penguin updates? Overall, I really like what Google doing within its algorithm. They are trying to filter out everything contrived, which is incredibly hard to do. They want real authority and credibility. So removing contrived links from their algorithm calculation is a worthy goal, despite the inevitable inaccuracies in doing that. And removing all the spam content from searches is obviously also good; they can’t recognize all the rubbish, but they can identify a lot of it, especially the worst examples. And what do you dislike about them? The only negative is the shameful way Google is treating webmasters by penalizing them and then demanding they change things like inbound links or even outbound links. Google should be devaluing the links (and anything else) it dislikes, rather than demanding that webmasters change their marketing patterns to suit its algorithm. Links don’t exist just for Google; the Web does not exist just for Google – the algorithm should be tweaked, not the things webmasters do outside the algorithm. What are your main source(s) of income? We are doing mostly book-writing and high-quality online content. As I mentioned, I am doing much less SEO than I used to, and that is good for the following reason. These days the most important aspect of promotion is creating incredibly good content, which mostly means writing. Three years ago, companies wanted the cheapest content possible. As long as grammar and spelling were correct, they were happy. So they hired mediocre writers to churn out perfectly spelled hog-wash.
Now companies realize they need quality content, not just well-spelled rubbish, and they need to pay for it. So they come to people like me who deliver really good articles – thought leadership articles, authoritative articles, the-only-source-you’ll-ever-need articles. That is much more satisfying to produce than pure SEO. If you were given a chance to start afresh with your online business, what 3 things would you change? I suppose I would start with a plan. I’ve pretty much just jumped on opportunities as they came along, and allowed the ebb and flow of the tide to dictate my business. Beyond that, it’s hard to say. Please provide your top 5 blogging tips for the DoSplash community! Number one is to write from the heart. If you frequently struggle with the question “What can I write about?”, then maybe you should not be blogging or maybe you are in the wrong niche. Number two. Blogging is about words, but attracting attention is about the visuals. Number three. Visuals are about the words, at least for drawing attention to your posts on social media. I have found that people will engage so much more if the image also delivers a message. Check out how I’ve been creating images for http://thgmwriters.com/blog/ I have found it makes a palpable difference. Number four. Engage. Whether you do it in the comments or on social media (like DoSplash) or on fellow bloggers’ posts, engage with other bloggers. Complement them, interview them, quote them, share their posts, add comments to their posts, acknowledge their comments – whatever suits your situation best. Number five. Don’t let anybody tell you how to run your blog, not me, not anyone else. Take what others say and use what makes sense and ignore the rest. Each of us speaks from our own experience, and nobody’s experience is the same as yours. Thanks for the tips. I’ve just been in a blogging rut lately. To the point where I’ve just decided to take a break from it and rethink what I’m doing. This article really was a big help with pointing out things I should be and need to be doing.